Who wants some MEAT?! That’s right, the guys at R&R BBQ are giving away a dinner for four people this month to a lucky reader and three hungry friends. If you read our story about the award-winning smoked goodness coming from R&R BBQ, you’ll be licking your fingers for this giveaway. From ribs to chicken and brisket to red beans and rice, Rod and Roger Livingston know how to make your mouth water with their stick-to-your-ribs comfort food. It’s all made with love and goodness and lots of barbecue sauce! *Winner will receive a certificate which is required for redemption. Must be used after 5 p.m. for dinner and is redeemable for dine-in only. Valid through 12/31/2014. To enter our competition all you need to do is leave a comment at the bottom of this post. As part of your comment, just let us know what your must-have barbecue food is? Bonus entry: As well as leaving a comment, sign up for our mailing list on the top right-hand side of the page and receive a second entry. Double your chances of winning this great prize. We will pick a winner randomly from all entries received on Friday, October 31, 2014. Obviously you have to have the meat, but a Bit isn’t complete without the Potato salad. Ribs, rubbed, smoked and sauce-slathered. With a side of cole slaw!! 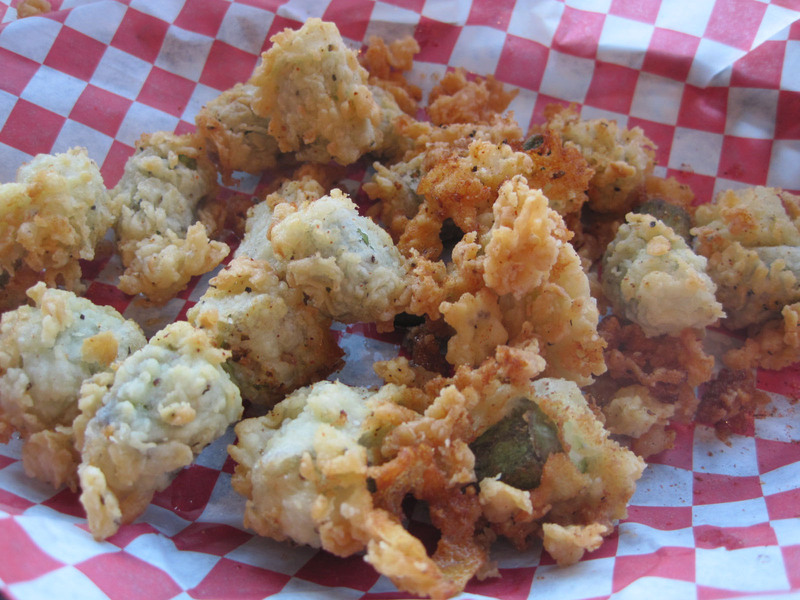 Am I the only one equally stoked about the fried okra? BBQ beans are also wonderful! My “Must Haves” for a good BBQ experience are a lovely portion of chopped brisket (more sauce to surface area ratio) & fried okra. Oh okra, that much maligned pod of slimy goodness makes a BBQ meal a real treasure. My fave meat has to be pulled pork. As for sides, I love mac and cheese with bbq. Oh my gosh. My mouth is watering just thinking of that brisket. Yes please. A definite must have to an awesome BBQ is homemade coleslaw! Fresh made coleslaw, ribs, pulled pork, sweet tea, mashed potatoes, apple pie, vanilla ice cream and of course you should wash it all down with a Black O Lantern Pumpkin Stout from Wasatch Brewery! Pulled pork and baked beans please! I’ve been wanting to try R&R for awhile. My go-to at a BBQ place is pulled pork, but I love I really love it all! I must have smoked ribs! 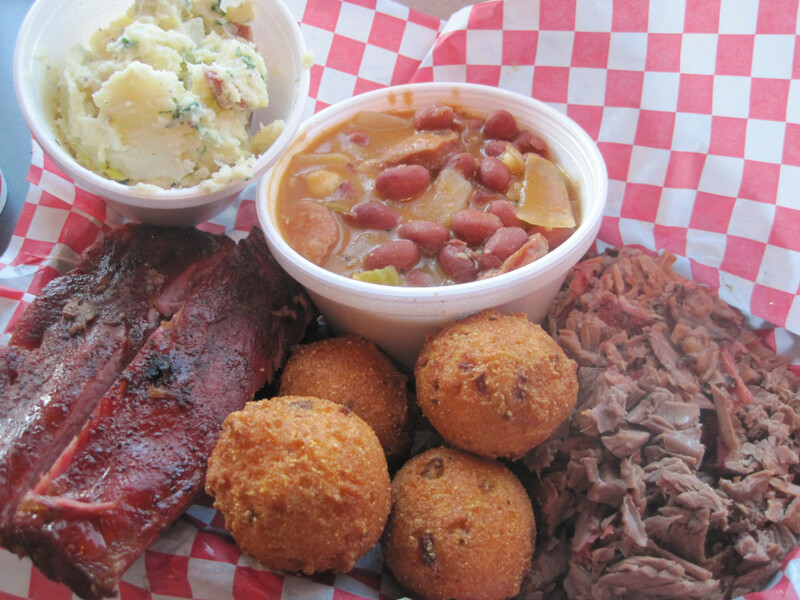 Must haves barbecue foods are chopped brisket, fried okra, and cole slaw! So yummy. Also, subscribed already. Love the guys at R&R … and the food! My fav is the brisket. And the peach cobbler. As a recovering vegetarian, believe me when I say that ribs are the all-time, must-have bbq food. But macaroni and cheese is my side of choice. I love their hush puppies! Yummy!! A great brisket and fall-off-the bones ribs are must-haves at a barbeque. As is a good sauce and lots and lots of napkins. However, depending on the company, a bottle or flask of a great bourbon can make a good barbeque excellent. I have to say burnt ends… The special leftovers everyone fights over. Mmmmm. Smoked andouille! I haven’t found good bbq since I moved here. Let’s hope they’re on to something! I like the pulled pork the best I think! I get it pretty much every time. My mouth waters just thinking about it. A deep smoke ring around the brisket, paired with some smoked German or Czech style sausage. Sliced brisket with a side of smokey spicy bbq sauce. Some quality sides are also a must. BBQ essentials, gotta have great sides. If I’m eating at R&R I’ve got to get the chicken, brisket mac n cheese and some baked beans.